Home / Blog / Reseller Hosting Vs VPS Hosting - Which is Best Choice? 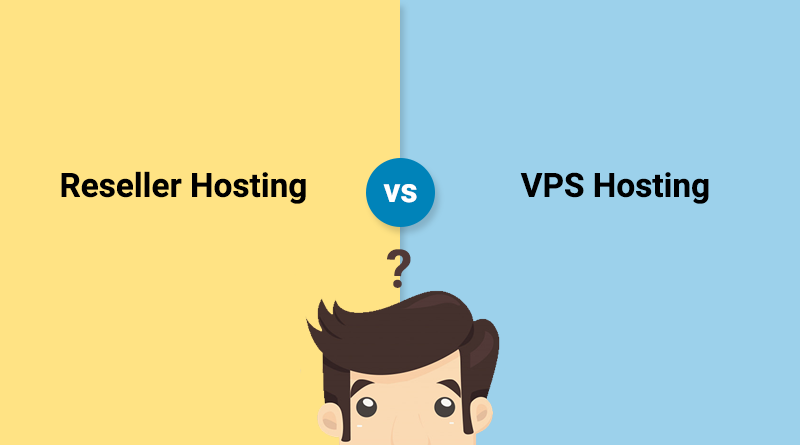 Reseller Hosting Vs VPS Hosting - Which is Best Choice? If you’re a business owner then you need to look after various parameters for getting your business online. The first step is to develop the website. Once it’s completed, the next is to decide the appearance and content of the website. The last step is to buy a web hosting service to host your website for taking it online. When visitors are searching for your website then make sure your site is live. If your website is down or not showing the results to visitors then it will take away your potential customers. In reality, web hosting is crucial in comparison to web design but, many businesses neglect this parameter and opt for the wrong hosting plan or web hosting provider. If you select the best server to host your website then it will affect the performance of the website in multiple ways like an increase in the page loading speed and the visitors will get a better user-friendly experience. While selecting the hosting environment, you will get confused because of heavy competition in the web hosting industry. In this article, I will compare the two popular web hosting solutions that are reseller hosting and VPS hosting. This will help you to select a better web hosting solution for your business. In Canada Reseller Hosting, you can resell the service and earn the profit. You buy reseller hosting from the web hosting provider and resell the same under your brand name. If you’re a designer or developer and entrepreneur then you can consider reseller hosting to start your web hosting business. Under reseller hosting, you can create your brand in the web hosting industry. You manage the client under your name by charging a small amount. You can involve several add-ons along with the hosting service like domain, Sitelock, WHOIS protection, SpamExperts, etc. The main benefit of reseller hosting is that with a small investment and basic knowledge, you can start earning. In reseller hosting, you get flexibility, affordability, and reliability. Make sure you have that much experience or knowledge, so that, you create hosting accounts for your clients. Being a reseller, you get the authority to know your customer needs and fulfill the same. * It is user – friendly and easy to set up and manage. * Basic knowledge is enough to start a web hosting business through reseller hosting. * It consists of easy to use control panel (WHM) that helps you to maintain your hosting account and set up customer accounts with no time. * WHM allows you to replace the WHM logo with your own company logo for the permanent establishment of your hosting company. * It is affordable and you get ample of options to choose from. * Upgrading of reseller hosting is easy and you get two options based on Linux or Windows operating system. VPS hosting is the next solution for those users who want to upgrade their hosting environment. VPS hosting is a combination of shared hosting and dedicated hosting. VPS hosting offers quality features in comparison to shared hosting. Under this type of hosting, you can host a website with a few users only. Whereas, in shared hosting, you host your website with several users. You will get a separate VPS hosting account. A VPS is a unique physical server that is split into multiple virtual servers. All users are eligible for resources like RAM, CPU, disk space and OS. Further, the user gains full root access of the server for managing the hosting account and websites. Being a VPS user, you receive a WHM control panel that is useful for creating multiple accounts and are used for reselling. VPS is beneficial for all types of businesses. * It is affordable and ideal for medium-sized businesses that need a customizable environment. * It gets scaled and upgraded easily. * With managed VPS hosting, you can focus on business expansion. You don’t need technical knowledge to operate a VPS account. * You can easily customize your VPS account. * With complete root access, you are able to perform tasks easily like modifying name servers, installing software, etc. Reseller hosting and VPS hosting are the most preferred types of hosting environments in the IT industry. You can select any type of web hosting environment as per your demand. Moreover, it is suggested to study well before selecting the hosting solution for your website. You will get several web hosting providers that offer the best solution to select the web hosting plan at a good price. So, carefully select a web hosting provider and earn a good income.